Friday morning was an historic one for Eastland Port, as the port’s new tug boat the Waimata arrived into harbour at 7am for a spiritual blessing by kaumatua Temple Isaacs. The Takitimu leads Eastland Port’s new tug boat, the Waimata, into the harbour. 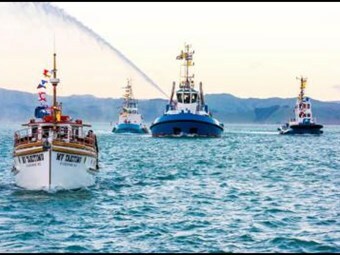 Built by Damen, a family-owned company based in the Netherlands, the tug left the Haiphong shipyards in Vietnam on 1 September, stopping in Papua New Guinea on her way to her new home in Gisborne. Damen representatives from the Netherlands were on board the Waimata when she came into Poverty Bay this morning, with Eastland Group chief executive Matt Todd and Eastland Port manager Andrew Gaddum joining them for the last half hour of the journey into the harbour. Mr Todd said the arrival of the Waimata was an occasion worth celebrating, not only for the port but for the wider Gisborne region. "The purchase of a bigger and stronger tug underscores Eastland Group’s commitment to continued investment in the port as we strive to improve both operating efficiency and safety. The Waimata is an important asset for the port, the forestry industry and the entire region." Named to fit in with Eastland Port’s other geographically tagged vessels, the new arrival will replace the 37 year-old Turihaua. This morning the Turihaua, the Titirangi and historic pilot boat the Takitimu all ventured out to greet the new addition to their fleet. At 24 metres, the Waimata is a far stronger and larger tug than the Turihaua, with a bollard pull of at least 65 tonnes and displacement of 400 tonnes. Mr Gaddum said the past few years had seen an increase in the general size of ships, particularly logging vessels, coming into Eastland Port. "Six or so years ago we were getting the 160m-170m vessels with a beam of 27.5 metres and 17,000 gross tonnes. Now we’re regularly receiving vessels that are up to 190m long, with a beam of 32.5 metres and a gross tonnage of 30,000 tonnes – and that’s unloaded. The extra bollard pull of the Waimata offers the port and its workers a greater safety margin when manoeuvring these vessels in the restricted area of the harbour. "Our tug masters have already completed simulator training, but this is a much more powerful vessel for them to operate," said Mr Gaddum. "The team starts training immediately and we expect the Waimata to be in full operation within a few weeks."